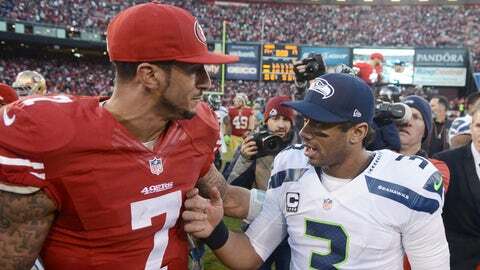 Colin Kaepernick and Russell Wilson will meet for the fourth time Sunday, this time with a Super Bowl berth at stake. SANTA CLARA, Calif. — Dan Marino reached his first AFC Championship Game in just his second NFL season. The Dolphins played the Steelers in January 1985 with a trip to Stanford Stadium and Super Bowl XIX on the line. With some help from NFL Films, I went back and watched clips from that that ’84 AFC Championship Game this week. I have no recollection of it and have never been in a conversation where the game’s come up, and quite honestly, I was curious to see what a post-Bradshaw, early-’80’s Steelers team even looked like. Mark Malone and his mustache played quarterback for Pittsburgh, a guy named Uwe von Schamann — yes, Uwe von Schamann — was the Dolphins kicker, and Miami running back Tony Nathan led the way with 175 yards from scrimmage. It wasn’t much of a game, a 45-28 Dolphins blowout victory in which the Steelers D didn’t resemble any likeness to the Steel Curtain units before them. But Marino was the story. He looks like a wide-eyed kid in the game footage, and that’s because he was. With long, flowing brown hair, a cannon for a right arm and incredible chemistry with receivers Mark Duper and Mark Clayton, he was lights-out in this one. Marino threw for 421 yards and four touchdowns in the game and punched his ticket to a Super Bowl he’d eventually lose to Joe Montana. Of course, what we didn’t know then that we know now is that it’d be the last time Marino would win a conference dhampionship game. Year 2. That was it. He’d reach the semifinal round of the postseason just two more times in his career — a 31-14 loss to the Patriots the following season and a 29-10 loss to the Bills in 1993 — but never get over the hump to hoist a Lombardi Trophy. I bring the ’84 AFC Championship Game up for a reason — and it’s not to be a pessimist or to cause any problems with fans in Seattle and San Francisco. I bring this up because I fear we’re not giving Wilson-Kaepernick Part IV its fair due this week. Manning-Brady XV is obviously the bigger storyline, and yes, even Harbaugh-Carroll gets the slight nod when it comes to personality-driven subplots. But Wilson-Kaepernick is awesome. In just their second seasons as full-time NFL starters, Russell Wilson and Colin Kaepernick are squaring off for the right to go to the Super Bowl. They’re different dudes. Kaepernick’s pretty guarded with those outside his immediate circle. Though you see him on various advertisements — a credit to his marketing team — he is a minimalist with his words, a man solely focused on getting through any in-season press obligations so he can get back to his team and onto the practice field. That’s not just talk. It’s real. And though this isn’t entirely uncommon for quarterbacks, when I arrived at the 49ers team facility at 8 a.m. Wednesday morning, Kaepernick was dripping with sweat, already an hour into a workout. Practice wasn’t set to start for another few hours. This is Kaepernick in a nutshell. Headphones on, working, grinding, sweating. Putting his energy into high leg kicks, not the media song and dance. Wilson’s more gregarious, cerebral. He’s gracious and measured. He could be the mayor of a small town in Washington, Wisconsin, or North Carolina if he decided he wanted to run for office in the next election cycle. I often ask questions about the young quarterbacks to the various broadcast crews on FOX, CBS and NBC who air their games. A lot can be gained from the meetings the TV teams have with players before telecasts. How a guy carries himself, his preparation, his respect for the game’s history and the guys who came before him can all come through in these sitdowns. When it comes to Wilson, they all say the same thing — you walk into a meeting with the guy wondering if he’s the real deal and you leave wondering if there’s anything he can do wrong. "I always walk away saying, ‘This guy’s too good to be true,’" one leading color commentator told me this week. "And he is. He’s the real deal." There’s no "Yeah, but …" with either of these guys. Kaepernick hit a stretch earlier this season in which the doubters came out in droves. But his teammates never did. His coach, who sings his praises anytime he possibly can, certainly did not. Wilson started off a bit slower in his first year as a starter but has seemingly done everything right since. The downside? Well, this probably can’t go on forever. Eventually, over the next three years, both men are going to have to get paid real quarterback money. The underrated, untold storyline for both these teams is how little their signal callers are making relative to the other big-name quarterbacks around the league. Joe Flacco, Matt Stafford and Matt Ryan all make roughly TWENTY times more than both Kaepernick and Wilson. TWENTY. With that luxury, Seattle and San Francisco are able to spread their wealth out a bit. The Seahawks can roll the dice on a Percy Harvin and sign guys like Cliff Avril and Michael Bennett. The Niners can trade Alex Smith for a bounty of picks and take on Anquan Boldin’s contract. And so I bring up Marino. Because for all this greatness, all these spoils in the NFC West, there’s a looming reality around the bend. We’ve had it so good with these two the past two years, and though we don’t want to think about it while everyone’s riding high, it could really all be over before we even got to appreciate what we had. Enjoy Brady-Manning XV on Sunday, but savor Wilson-Kaepernick IV. It’s not a given that we’ll get too many more. Now on to some trivia and my picks. Cheat Sheet Trivia Question: Besides LeGarrette Blount, only one other player in NFL history has run for four or more touchdowns in a playoff game. Who is this person? Answer below. New England at Denver: No Jerod Mayo. No Brandon Spikes. No Vince Wilfork. No Wes Welker. No Deion Branch. No Brandon Lloyd. No Rob Gronkowski. No Sebastian Vollmer. No Danny Woodhead. No Aaron Hernandez. And no problem? It’s amazing, really, to think how great the Patriots looked last Saturday night, despite the lack of names on their roster. The truth is that this team adapts to any adversity, any condition and any obstacle. I was almost more impressed with the Patriots’ walloping of the defending-champion Ravens in a nationally televised showdown in Baltimore back in Week 16 than the comeback win over Denver a few weeks earlier. The Baltimore game showed me a different side of this New England team. The Patriots didn’t just beat the Ravens that day, in a game that would have catapulted Baltimore into a simple "win-and-in" situation the following week; they beat the living daylights out of them. I was in that Patriots locker room afterwards. A different team would be laughing, joking around with "Division Champion" hats on. But after the 41-7 thrashing, the Patriots kind of went about their business, got dressed and boarded the buses. They knew they hadn’t won anything yet. The same could be said for their performance last week against the Colts. Business as usual. All eyes are on Peyton Manning and what’s at stake for him, but Tom Brady knows he hasn’t won a Super Bowl since the 2004 campaign. This team isn’t going softly into the night as some liner note to Peyton Manning’s swan song. They’re going to come out hitting — and they’re going to come out on top. Expect Blount to continue playing the Corey Dillon 2.0 role to perfection, and look for some unsung defensive players — guys like Jamie Collins, Steve Gregory and Logan Ryan — to continue to make big plays. This has all the makings of a classic Manning-Brady shootout, but I see it being an old-school Manning-Brady game that’s actually won on the ground and in the trenches by everyone else on the field. Brady wins in a slugfest, not an aerial show. And in the locker room afterwards? The Patriots barely even smile. 49ers at Seahawks: I know I’m not alone when I say I’m a little over the whole 12th Man thing. I know the Seahawks fans are excellent, and I’ve seen and read 10 too many pieces on why their stadium is louder than all the others (hey, did you know that it rains in Seattle? And that they throw fish at that market? ), but I think the 12th Man stuff takes away from just how good a football team the Seahawks are. The fans and the crowd noise didn’t keep Drew Brees bottled up for three and a half quarters last Saturday. No, that was an incredible front seven paired with the most physical defensive backfield you’ll find in the NFL today. This one has has the look of a classic, and it absolutely will be. Kaepernick broke out a Superman touchdown celebration in Carolina, but Seattle’s been his Kryptonite. He’s 0-2 all-time in the Pacific Northwest, with his 49ers being outscored 71-16 in those two games. But there’s something about Kaepernick this time around. Something different. Over the past two months, he’s been a different player. The 49ers have won eight straight games, and the entire team continues to deflect any attention from themselves; instead they point to their quarterback. Look for a lot more no-huddle early on, limiting the effectiveness of the 12th Man, and look for Kaepernick to break off a few early runs to set the tone. Passing the ball deep — although it’s something Kaepernick can do — isn’t what will win this game for 49ers. It’ll be establishing the run, and in addition to Frank Gore and the running backs, I expect Kaepernick to do his part. It’s going to take a Superman effort to beat Seattle in their building, but I think this 49ers team is peaking at just the right time. I like both road teams on Sunday. I’m taking the 49ers. Cheat Sheet Trivia: 49ers running back Ricky Watters ran for five touchdowns in the 1993 Divisional Round against the Giants. The game happened to be the last one Lawrence Taylor ever played in.